« Thanks for tuning in and listening to this our first show on the music industry! A look into the ways memes and internet trends have changed the way we experience things. With an enormous network of contributors from all over the world, It’s no wonder that “Global Mind” has engaged in trivial pursuits such as can be found in trends on sites such as Reddit and Twitter. Our sense of humor has essentially evolved with the medium. It builds, as posts on Tumblr do, with one person blogging and another reblogging a witty reaction resulting in a chain of humorous quips that make internet history by becoming Memes. In this MEME WORLD, we think and speak in joke form and sarcasm and witticisms stroll into just about every conversation we have. So here’s the question: Is our comical way of looking at things a sign of a global change in our sense of humor? What will our infinite collection of online visual and audio visual recordings of humanity at its most hilarious do for us, in the long run? When we look at history books(Ebooks) in 50 odd years, what will future generations think of our online witticisms? They both check twitter and point out the latest trending post via #firstworldproblems , a tag used to ridicule first world inhabitants complaints about things they are privileged to have. The conversation continues, and one person or other says something funny or witty and immediately takes to posting it on Twitter. The previous conversation is surprisingly commonplace. Because we are constantly connected, we experience existence at the click of a “post” button. One tweet = an affirmation of two things: I exist and I am interesting. This results in an egocentric mindset fueled by our desire to amuse others and get attention for our display of intelligence. Though Twitter has been used to spread the news, share photos and report important information, the majority of its users are ordinary people going through the motions of their days, using this social media outlet to vent their frustrations and find humor in otherwise boring situations. As a result, we have begun to do things and immediately think about 140 characters to describe them or, in the case of Tumblr users, what a good gif that would make. 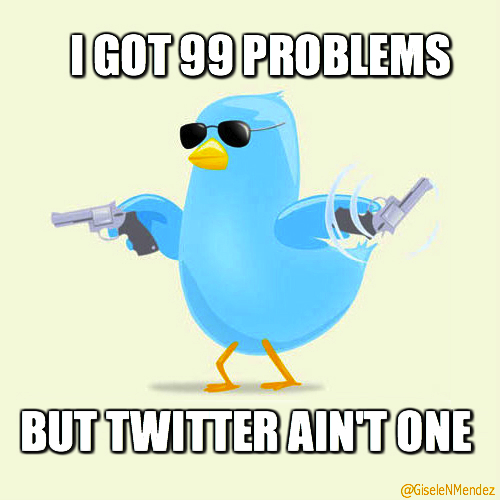 I tried to join Twitter on numerous occasions but found the pressure to be witty a little too much to handle. It’s not that you have to be funny to have a twitter account, but one must recognize that no ordinary status will suffice to spark interest and gain followers. We feel we have to be amusing in order to get attention. As the generation that has created these MEMES, we have brought on a world that calls for entertainment 24/7. It’s no surprise that we have become a part of said entertainment, oftentimes taking the stage and standing on a metaphorical soapbox to tell complete strangers just how we are doing today.